Job-related deaths in Turkey have increased by ten per cent since the enactment of a state of emergency following a failed coup attempt in July 2016, according to a report by the Workers’ Health and Work Safety Assembly of Turkey (ISIG). Labour in Turkey now finds itself squeezed between restrictive laws exacerbated by the post-coup crackdown and a huge government push for construction projects that lack oversight and use short-term workers. These contract workers are found through informal networks that make it difficult to speak out about workplace safety. Almost a quarter of last year’s deaths were in the construction sector, which the Turkish government promotes heavily through projects like dams and bridges. In June 2017, the construction sector employed 2.17 million workers, more than Turkey’s total unionised workers. “The Turkish economy is built on construction,” says Nurşen Gürboğa, a history professor at Marmara University whose work focuses on labour policies. Particularly popular among the ruling Justice and Development Party (AKP) are infrastructure megaprojects. The Turkish government is investing hundreds of billions of dollars as part of its Vision 2023, an ambitious set of goals that involve expanding the country’s GDP to US$2 trillion in a bid to make Turkey one of the world’s ten largest economies. In Istanbul alone, transformative projects include a three-storey tunnel under the Bosphorus Strait for motor traffic and public transport, a 45-kilometre artificial waterway to slice through the European side of the city, and a third airport, which will purportedly house the world’s largest airport terminal. Scheduled for completion on 29 October 2018, the 95th anniversary of the modern Turkish Republic, Istanbul New Airport is moving forward at a brisk place despite more than 400 workers reportedly dying on-site. In the local media, workers compared the work site to a cemetery. Snap elections will be held on 24 June this year and supporters of President Recep Tayyip Erdoğan often tout the economic gains made under AKP’s 15-year rule. But despite pouring money into infrastructure projects, the Turkish economy is currently struggling with the lira reaching a record low against the dollar and double-digit inflation. “The AKP government has been focused on revitalising the economy and they see results from these larger infrastructure projects,” says Aşkın Süzük, the lead researcher for the Petrol-İş union for petroleum workers in Turkey. Subcontractors do not receive the same rights or benefits as permanent workers, and ISIG’s data shows that 98 per cent of the workers who lost their lives in 2017 were non-union or temporary workers. 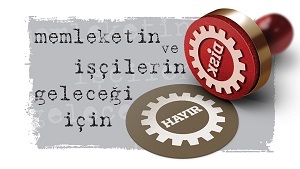 Gürboğa describes the position of subcontractors as precarious, saying that “most integrate into the informal economy. They are unregistered; to organise them into unions is very difficult.” The main opposition party, the Republican People’s Party (CHP), claims the use of subcontractors has increased 500 per cent under the AKP, putting the number of subcontractors at close to two million out of 13.8 million workers. The government’s most recent figures have unionised workers at only 1.7 million. Umar Karatepe, a spokesperson for the Confederation of Progressive Trade Unions of Turkey (DISK), says that he disagrees with the government’s reasoning that deaths occur in the construction and mining sectors so frequently because the nature of the work is more dangerous. Rather, Karatepe says, the government is too focused on finishing jobs quickly with fewer workers: “If you don’t have job security, you don’t have job[site] safety,” he tells Equal Times. When employers are inclined to work with unions, changes that benefit workers can occur, says Süzük. Still, when dealing with intransigent employers, unions have seemingly lost the ability to enforce what Süzük calls “the most important weapon” for challenging employers – the strike. In 1963, in one of a series of legal changes that followed the 1960 coup, Turkey’s Council of Ministers gained the power to ‘postpone’ a strike for up to 30 or 60 days. Following another coup in 1980, the military junta enshrined this principle in a new constitution. The government could now decide if strikes were a threat to national security or public health and temporarily halt those that were. Today, Suzuk says that while strikes are allowed in theory, they have effectively been banned since the most recent coup. In the year following the 2016 coup attempt, the government banned five strikes, compared to stopping eight strikes in the preceding 14 years. “Because [employers] know we cannot strike, they are more comfortable violating contracts,” he says. The government carries out this ban on strikes by calling for a ‘postponement’ and forcing the union to negotiate with employers during this period. “If [unions] do not reach an agreement with the employer, then the union loses its right to represent its workers in collective bargaining,” says Gürboğa. Additionally, organising public demonstrations relies on using press attention as leverage against employers, a tactic made more difficult under the government’s crackdown on press freedoms and the media’s virtual blackout on labour issues. Ultimately, state of emergency laws, which allow the dismissal of workers without due process, mean that workers are less safe in their positions and have fewer forms of recourse. The government formed an ad hoc commission to review the cases of dismissed workers in 2017. It received over 38,000 applications in just one month. The injurious wait as the commission picks its way through cases and lack of guarantees are mirrored in workers’ attempts to challenge companies in lower courts. DISK’s Karatepe says workers can try to dispute firings, but “first you must go to arbitration and then court, you lose time” – time that many workers cannot afford. By DISK’s figures, the average worker is at the same workplace for only one to three years. With so many workers moving from place to place, there is less pressure to provide safe working conditions and less ability to unionise. The results are clear: more worker deaths.